How much does our selector get out of this? Not the one to not take a hint, Indian Tennis Federation also announced special reward of “Kaya Skin Clinic” discount coupons for the winning duo. “It’s a handsome discount of 74% on full-body skin treatment”, said the official release. Not only this, Leander Paes and Mahesh Bhupathi were greeted by thousands of chanting fans in Mumbai, all the way from the airport to their respective homes in suburbs. Most of them were obviously drunk, lying on the roadsides, and forwarding any SMS that came their way. 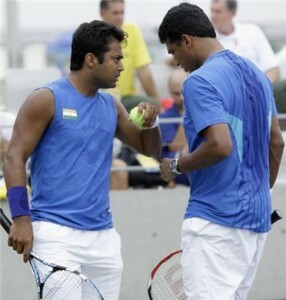 “Of course they were chanting our names – Mahesh and Leander is Mahender”, said Mahesh Bhupathi. “As I entered my home, firecrackers were still going up”, said an ecstatic Leander. “Surely it can’t be because of the World Cup win which is already 3-days stale now”, he added hesitantly. Meanwhile UPA has announced a cash-reward of Rs. 1-Crore for Rahul Gandhi too, for “being present at the venue and inspiring a win – a rare occasion”. New Delhi. 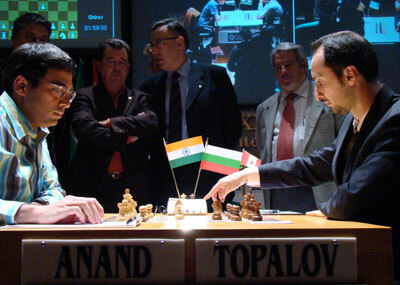 12 May 2010. Anand was unavailable for comment but KKR team owner SRK tweeted soon after with an affirmative “V can do with a good opener.” Sources confirmed that Anand will be back home by the weekend, and an official delegation of sports ministry, comprising of hired Babu-looking men and saari-wearing smile-wielding women, as well as clueless officials will be there at the New Delhi airport to receive him. Before the official reception next evening, a special slide show presentation, titled ‘Who is V. Anand and why are we felicitating him’, will be held in the secretariat for the various ministers, cricketers, and celebrities attending the party. Indian Cricket team captain MS Dhoni, making it home just in time for the party, seemed happy by the news of Anand winning. “It’s been 2 weeks since we had a good party. Looking fwd”, a random sms by him read. Meanwhile, Rahul Gandhi and Bill Gates bonded big time over Amethi’s broken windows and Uttar Pradesh’s barely operating system. 2 May 2010. St Lucia. It was a bitter moment of truth for Indian pace bowler Vikram Mehra (name changed on request) as he walked up to captain Suresh Shetty (name changed on request), during India’s first World T20 tie with Afghanistan. Vikram was just following the protocol when he asked Shetty – “How many boundaries in this over captain? Do you want the 5-wide that goes behind the wicketkeeper first up or shall I save it for the end of the over? More drama…eh?” The captain’s moist-eyed reminder to him that “IPL is over”, and this is World T20, left the party-animal Mehra shaken. Mehra is not alone. If sources are to be believed, almost every player in Indian dressing room is feeling the pinch. Says Rajendra Makwana (name changed on payment), India’s biggest-hitter in T20s: “It’s insulting to get out just because the bowler has bowled a good ball. Earlier, in IPL, we got out only when we wanted. And were getting paid for it too! This is crap.” For new players like Arjun Paliwal (name changed to protect identity), who is incidentally making his International debut with this World T20, the situation is even more disorienting. “I grew up listening to the tales of late night parties, babes, and a lap-dance for Sid Mallya. The atmosphere here is highly disillusionary” he says, before casually reciting an over-by-over “fixing-table” to show how prepared he had come to this format. “I can really cram the whole ball-by-ball fixing pattern – I could’ve been an asset”, he bets. Team coach and manager KK (name shortened on request) though chooses to look at the silver linings. “Shonali Nagrani is still here. So is Rameez Raja! We are not really misisng Mandira and Sameer Kochhar that much”, he smiles. But prod a little deeper and Kotla-like cracks start to appear in his ‘all-is-well’ demeanour. “I see Lalit Modi in my dreams”, he confesses while hiding his eyes behind dark glasses. “Those were good times”, he adds before walking off. The Daily Tamasha · Fake news. But then, what's real?